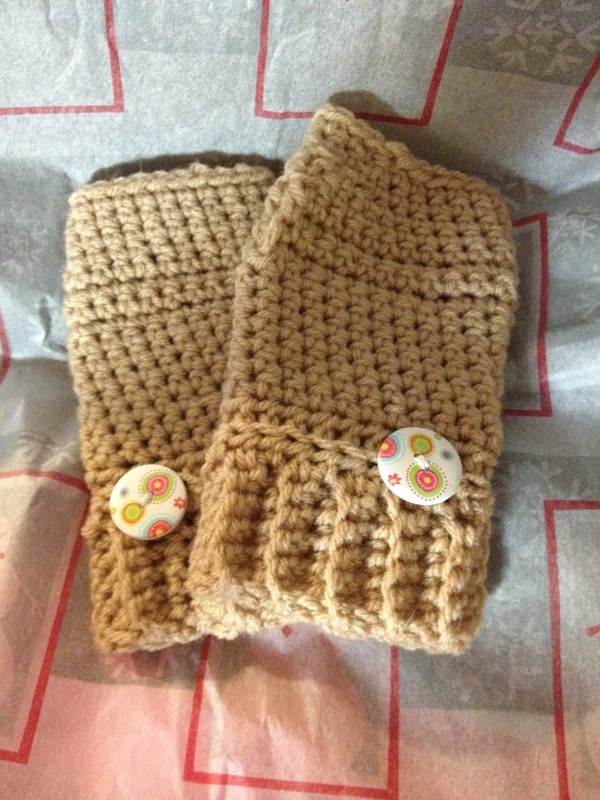 One of the Christmas gifts I gave this year was a pair of fingerless gloves that I made for my mom. These were a big hit! Apparently she wore them almost all of Christmas day. Like me, she’s someone whose hands get cold in the winter – even in the house where you have to get things done and need your fingers free, so something like this is a perfect fit! I’m thinking of making a matching pair for myself, especially since I have more of those cute buttons left over! I also really like the simplicity of the pattern, with the ridge above the ribbing and the single stripe that goes around the glove at thumb level. The pattern lays smooth, unlike some fancier patterns, which makes it more practical for everyday wear. If you would like to make a pair for yourself, you can find the free pattern online here. There’s also an infinity scarf pattern that matches if you want to create a set! What’s interesting about the pattern is that you work the cuff first, in side to side rows that become ribs when joined together to form a ring. Then, you work the rest of the glove inside out. I have never had a crochet pattern that works that way before! The pattern is super simple, using only basic stitches and joining techniques and would be suitable for beginners. I finished this in two evenings (one glove each evening) and then spent a few minutes the next day sewing on the buttons. Those came from the craft aisle at one of our local dollar stores, by the way! As I’ve mentioned before, such a great place to find crafting supplies! I used Red Heart worsted weight yarn instead of Vanna’s Choice, though I can’t tell you the colour name, as the label perished long ago. I try to give some homemade gifts every Christmas, not only to my husband as I mentioned in last week’s craft post, but also to others that I love. There is something about a homemade gift that says a lot more than clicking on something on Amazon does! It’s an “I love you” that repeats every time the person uses, wears, or sees what you created for them, and lets them carry a little bit of you around with them all the time. I still wear them all the time. Will need washing soon. I assume cold water wash will be okay. I’d do gentle cycle – actually, I’d handwash in cold water because of the buttons! Katie, the link is missing the “R” at the beginning. It’s showing as escuedpaws and giving a broken link. Ack, thanks Dawn, I’ll get that fixed!